This article is about the enemy in the Paper Mario series. For the enemy in Super Mario Odyssey, see Poison Piranha Plant. A Putrid Piranha is a large Piranha Plant with a poisonous bite and poisonous breath, found in the Paper Mario series of games. The Putrid Piranhas of Paper Mario are found on Lavalava Island. These Putrid Piranhas are red with white spots and have yellow-stained teeth. Putrid Piranhas are close relatives of the Piranha Plants, but are distinctly larger, and have lolling tongues. Due to their forward-facing head, they can be safely jumped upon in this game. Some of them appear as mini-bosses in the Jade Jungle located on Lavalava Island, while they appear as common enemies in Mt. Lavalava itself. During battle Putrid Piranhas can use a poison breath attack, which poisons Mario while doing two points of damage. In Jade Jungle, a few of them attack Orange Baby Yoshi. The Frost Piranha uses recolored Putrid Piranha graphics. Putrid Piranhas reappear in the sequel of Paper Mario as well and can be found on Keelhaul Key as uncommon enemies. Instead of being red with white spots, they are yellow with red spots. In addition, they have purple teeth, green lips, and a blue tongue. Like their Lavalava relatives, the Putrid Piranha has glands that turn their breath into a lethal poison. Unlike their Lavalava relatives, they stand upright, making them impossible to jump on normally (unless Mario has the Spike Shield badge equipped), and are not known to live in burning temperatures. They are also no longer larger than their relatives, due to now being recolors of regular Pale Piranhas. These are the Putrid Piranhas that live in the Land of the Cragnons in Super Paper Mario looking the same as the Putrid Piranhas from the previous game. This Putrid Piranha emerges from pipes and will only use its poisonous breath instead of the chomp. These Putrid Piranhas have a high chance of dropping items, especially Horsetails due to the poison status being very deadly if the player has no items. It is possible to stomp it when it is exhaling the poisonous gas by jumping on its exposed head. 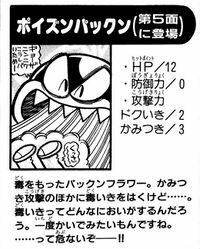 Putrid Piranhas appear in volume 26 of Super Mario-Kun. When a White Magikoopa ambushes Mario and his partners in Lavalava Island, he uses Putrid Piranha plants. They bite Mario's head and let out a bad breath, poisoning Mario and Goombario. The Fearsome 5, however, comes to the rescue and attack the White Magikoopa while sealing the Putrid Piranhas' mouth with tape. One of the Yoshis then defeats the White Magikoopa by using a Thunder Rage on him. In Super Smash Bros. Ultimate, Piranha Plant turns into a Putrid Piranha during its Poison Breath move, and spits poisonous gas to damage other fighters. It is also mentioned briefly by Viridi during Palutena's Guidance dialogue for Piranha Plant. Tattle This is a Putrid Piranha. Max HP: 12, Attack Power: 3, Defense Power: 0 Putrid Piranhas sometimes bite, but the truly scary thing is their nasty, poisonous breath. The power of their bad breath is 2, but your HP will begin to fall if you get poisoned. You should try to recover as quickly as possible if you get poisoned. Card Description It's a poisonous Piranha Plant. As they say, every rose has its venomous bite. Stinking Piranha. "Kipu" is pun on qui pue (stinking). ↑ GameXplain (November 1, 2018). Piranha Plant in Super Smash Bros. Ultimate - Reveal Trailer (Petey Piranha Final Smash!). YouTube. Retrieved November 1, 2018. This page was last edited on March 1, 2019, at 22:07.